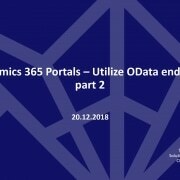 In this screen cast, I show you how to use the Dynamics 365 Portal OData endpoint. It is very useful interface to query data from server side to the portal forms. Especially in such scenarios where you need to fetch data from related entities for a portal form. The programming part of this is very simple and easy to use. With a few lines of JQuery and knowledge of the syntax, you are on your way of making the portal user experience better. I use one specific example here in this screen cast video where I need to pre-populate a lookup field of a portal form with a value from a related entity. I utilize the context of the portal logged-on user (Dynamics contact) and then do the OData query against the REST-based interface. This is over-simplified example which can easily be used as the basis for more complex scenarios. Hopefully by following this example, you get an idea how to use the OData feed and you are able to utilize it in your Dynamics 365 Portal extensions. If you have any questions related to this or other Dynamics 365 Portal subjects, I’ll be happy to help. This is the fourth part of my Dynamics 365 portal video series. In the first part, I showed you how to install the Dynamics 365 portal instance and how to make basic configurations into it. In the second part, I showed you how to do the portal UI customizations. Third part was about JQuery customizations in Dynamics 365 portal forms. There will be more coming up so thank you for watching and stay tuned for more.